This beautiful, spacious one BR is located on the 8th floor of the tallest building in Bayonne, NJ with stunning views, overlooking New York City- One World, Verrazano Bridge, Brooklyn and Downtown Manhattan. This condo has been loving maintained by its owners. However there is a dedicated superintendent living on premises 24 hours a day, if ever needed. Included in your HOA fees- Electricity, Heat, AC, Water, Sewage, all outside/exterior maintenance and snow removal. This is especially helpful for your parking space - which is located across from the rear entrance. How easy is that! Although this building is located in the safe township of Bayonne, for added security, there are cameras in the lobby, parking lot, mail room and basement. There is a lot of care in to upkeep of the grounds as well as on each floor of this prestigious building. The home is wired a security system, cable and internet services. The laundry facility, located in the basement, is available 24 hours a day. Enjoy the sparkling outdoor swimming pool, open from Memorial Day through Labor Day. The building supplies chairs and a lifeguard during pool hours. On most days you will get to enjoy the pool by yourself.The kitchen features a new Samsung stainless steel stove/oven with refrigerator and dishwasher. The flooring has off-white ceramic tile with a white tile back splash. There is ample space for preparing meals. There are tall cabinets throughout and underneath. Form the kitchen you can see the great views. Right off the kitchen is the dining room, which features burnt amber glazed ceramic tile flooring. The windows are tall so you can enjoy a bright and sunny DR and LR with a view that cannot be beat, perfect for entertaining guests. There really is an abundance of natural light that comes into the LR and DR. The large LR, extends to the width of the unit. It has beautiful dark brown wood laminate floors. This living room is very spacious.The hallway leads to the bedroom which had the same burnt amber glazed ceramic tile flooring as the dining room. There are two closets in the hall, one at entry way and one closer to the powder room. The bathroom has white tile throughout walls and floors and a large three door, mirrored medicine cabinet with a nice size shower/tub. The master bedroom is located at the front of the building and features the same view as the DR & LR. It also features the same laminated wood floors as the living room and is big enough for a king size bed with plenty of perimeter space for furniture. The BR closet is quite large and can hold clothing for two people. The garbage disposal room is only 30 feet away from your front door on the 8th floor, so you never have to go outside to put trash out again! Public transportation is close-by, the light rail station is a few blocks away, and buses to New York are right across the street. Bayonne Park is located down the street as well and features 11 square miles of bbq, tennis, walking trails and the wonderful walkway alone the waterside is impressive. This property is a block away from Route 440, a 10 minute drive to Holland Tunnel and a 2 minute drive to NJ Turnpike. 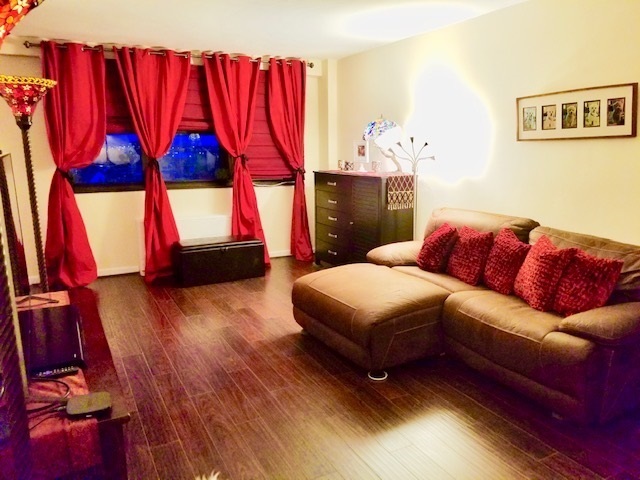 Located next to Marist High School this a wonderful location for commuters to NYC. Woodrow Wilson Grammar School and the Bayonne fire station is right around the block as well. Retails stores close by include Walmart, the Bayonne Movie Theater, Costco, three local grocery stores, Home Depot, Lowes, numerous chain restaurants, the best pizza in NY or NJ, great Italian food restaurants, post offices, City Hall, Liberty State Park, DMV, and more no more than 10 minutes away from the address!The building has a wonderful community of people who are friendly, helpful and invested in a strong quality of life. A majority of your neighbors are owners. They are quiet and respectful to each other.